Having forged heirloom jewelry and wedding bands for 129 years, Christian Bauer believes quite literally in “jewelry as a timeless symbol.” So, although its wares and methods are steeped in tradition, today the exacting design house utilizes advanced techniques to produce custom-forged, die-struck rings, with fashion-forward design elements. Christian Bauer was an ambitious young silversmith who, in 1880, started a business creating original pieces and peddling them door to door. By the early 1900s, Bauer employed his sons Karl, a gifted goldsmith and artisan, and Friedrich, skilled in both sales and business. As the family tree sprouted new branches, so did the company. Friedrich’s daughters, Elise and Elfriede, joined the family business and, when they married – in a double ceremony – the talented new sons-in-law, Julius Keller and Helmut Hutt, became partners too. Keller’s fresh design perspective – inspired by both his native Germany as well as his extensive world travels – added new depth to Christian Bauer pieces; Hutt’s technical expertise elevated the company’s production values in terms of reliability and precision. Today , the family legacy continues with Christian Bauer’s great-grandchildren: Helmut’s daughter, Uta Hutt, acts as a general manager, while her sister, Eva Schneider (formerly Eva Hutt), and their cousin, Rosemarie Hirzel (formerly Rosemarie Schneider), are active partners in the company. Although all of the workmanship and alloying is still performed in Germany, the brand is sold throughout the world, and distributed in North America and the Caribbean by Penn Gem International, which is sincerely passionate about the product. The company has certainly seen its fair share of difficulty in the past, having survived through two world wars. Fortunately, it seems to be as resilient as the wedding bands it produces. Christian Bauer has consistently used creative strategies to come through hardship stronger than before. 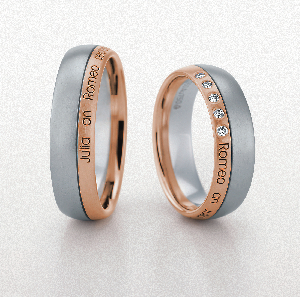 There are elements of the wedding band business that remain timeless, of course. “Men want style and durability,” Schwotzer says – and, as fate would have it, that’s exactly what Christian Bauer is all about. 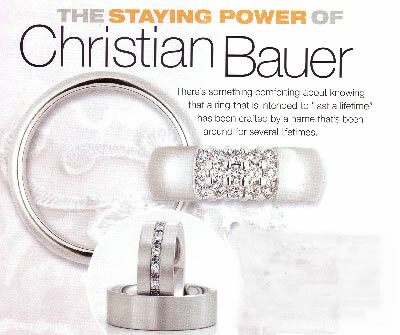 Get to know Christian Bauer wedding rings and see how a high value wedding ring is produced.